NASA’s Curiosity is currently investigating the Gale Crater on Mars. Last weekend the Mars rover pierced for the first time a hole in a rock called John Klein. Now it is possible to look over the shoulders of Curiosity on to his workplace. The interactive panorama of photographer Andrew Bodrov shows the workplace of the Curiosity in a 360 degree view. The statue is made of 130 photographs that the Mars Hand Lens Imager made​​ earlier this month, which is attached to the robot arm of Curiosity. Curiosity has to analyse the drilling dust from rock John Klein to trace the chemical composition. This is the most complex operation that the Mars rover hitherto on the Red Planet has done. After his drilling task, Curiosity will drive the next nine months to a mountain. 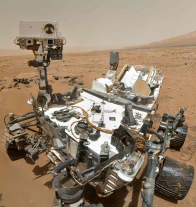 Previous Mars rover hacked in the rock of the planet, but Curiosity is the first to drill in the rock layer to obtain samples. These operations are so complex that scientists gave instructions over multiple days to perform a test bore. Curiosity landed on Mars in August 2012. The next two years the moving laboratory will investigate soil, rocks and sky. Scientists would like to know whether life ever existed on Mars.